Students can refer the revision notes on chapter Bimolecules given in this article to score good marks in Chemistry subject of UPSEE/UPTU entrance examination 2018. It is impossible for students to grasp everything from the books and recall the same in the examination. As competition is getting tougher day by day, students don’t want to waste their precious time in reading the topics from the book just before any engineering entrance examination. They want to study only the concepts which are very important from the examination point of view. To fulfil this need of engineering aspirants we bring the study notes and important previous years’ solved questions of chapter Bimolecules for coming UPSEE/UPTU examination. They are the organic molecules that are involved in the maintenance and metabolic processes of living organisms. Thus, they build up the living system and are responsible for their growth and maintenance. Monosaccharide: These are the simpler carbohydrates which cannot be hydrolysed further to its constituent aldehyde or ketone. For example glucose,fructose, galactose etc. Disaccharides: It is a sugar which can be hydrolysed into two monosaccharides. 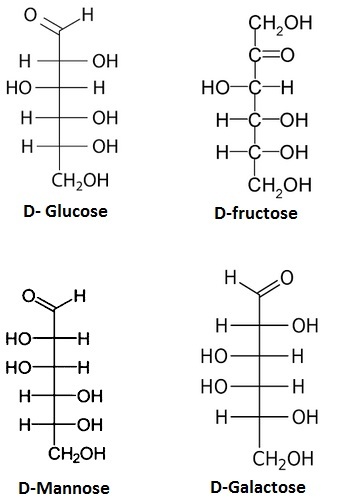 For example sucrose, lactose, maltose. Polysaccharides: These are carbohydrates which on hydrolysis yield many monosaccharide units. For example starch, cellulose, glycogen, gums, etc. Monosaccharides and oligosaccharides are crystalline solids, soluble in water and sweet in taste. These are called sugars. Polysaccharides are amorphous, insoluble in water and tasteless. These are called non-sugars. For defining D and L configuration of sugar the compound glyceraldehydes, HOCH2CH(OH)CHO was chosen as the standard. Compounds that resembles D-glyceraldehyde at one terminal is known as D-sugar. Similarly, compound that resembles L-glyceraldehyde at one terminal is known as L-sugar. Note: Natural sugar are D-sugar and synthetic sugar are L-sugar. 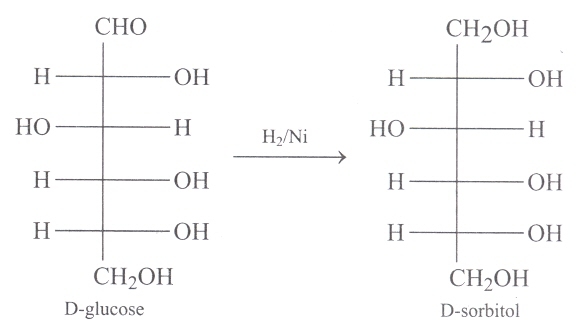 Note: Ketose is not oxidized by Br2 – H20 because it causes epimerization. Ammonical AgNO3 is called Tollen’s reagent. It oxidizes aldehyde group of sugar into carboxylic acid. Note: Ketose also give Tollen’s test because of basic medium. In basic medium Ketose is first of all epimerized to aldose and aldose gives Tollen’s test. Reducing Sugar: Those sugar which reduces Tollen’s reagent are called reducing sugar. Non Reducing Sugars: Those sugar which fail to reduce Tollen’s reagent are called non reducing sugar. 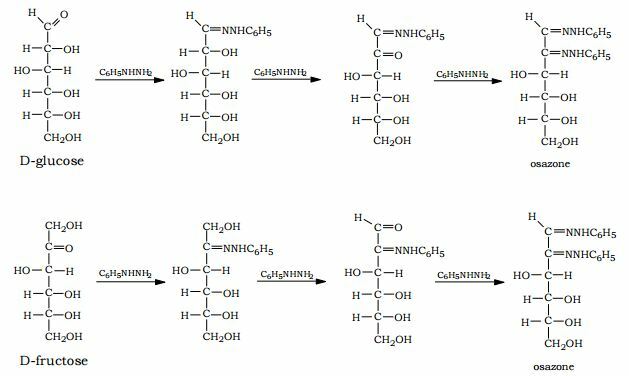 Both glucose and fructose react with phenylhydrazine whose chemical formula is C6H5NHNH2 to form osazone. Reduction: Sugar are reduced either with NaBH4 or with H2/Ni into sugar-alcohol. D-glucose rotates the plane polarised light to the right. Which of the following pairs give positive Tollen’s test? Aldehyde gives positive Tollen’s test. However under the strongly basic condition of the test α-hydroxy ketones can isomerise to aldehydes so that’s why they also give a positive Tollen's test α - hydroxy ketones. 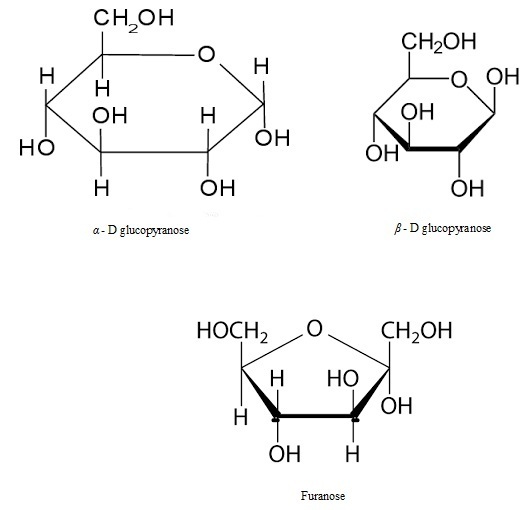 The two forms of D-glucopyranose obtained from the solution of D-glucose are called anomers. They are: α-D(+) glucopyranose and β-D(+)-glucopyranose. Anomers are a pair of stereoisomer which differs in configuration only around first carbon atom. Students will find every important topic related to Bimolecules here. They can refer the topics mentioned in these notes instead of reading the complete theory from the books to save their time. It is presented in a systematic manner to help students in grasping the content easily. How to score good marks in UPSEE 2019 even when you have not prepared well?